Just a quick post to explain how I will be making my jam today. Wish me luck! It is really more of a rule or a technique than a recipe. Prep all the ingredients. Just hull the strawberries, only half them if they are big. Combine the berries, the lemon juice and the homemade pectin if you have it. Cook over low heat till it comes to low boil. Stir occasionally.Add the sugar and stir till dissolved over medium heat.Cook with very little stirring till setting point. To tell if it is done take some out and let it cool on a plate. If no juice or moisture gathers about it and it looks dry and glistening, it is done thoroughly. Also if you nudge it with your finger tip and it crinkles it is done, after slightly cooled. 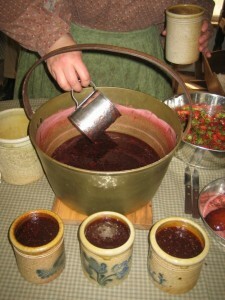 Making Strawberry Jam at Hillside Homestead. This entry was posted on Wednesday, June 26th, 2013 at 8:47 am and is filed under Preserving food. You can follow any responses to this entry through the RSS 2.0 feed. Both comments and pings are currently closed. 2 Responses to “Strawberry Jam… let the fun begin” Comments are currently closed. Susan, I want to come and learn to cook from you! I’m a novice at historic cookery but oh so interested! Hi Trisha! I do teach classes! Are you in the area?